Frame Size: 0-299 square inches300-600 square inches (+$10.00)601-899 square inches (+$15.00)900-1200 square inches (+$20.00)1200+ square inches (+$30.00) Frame Style: Aluminum frameFlexible frame (1/2 inch thick) Enter Filter Size (ie:16x25): Enter Filter Thickness: 1 inch (standard)2 inch (+15)1/2 inch (Flexible) Please Choose One: This size is printed on the filterI measured the filter myself This item is currently out of stock... Please contact us about backorders! Genuine BOAIR 5-stage electrostatic filters. Please note that Canadian buyers will also pay customs charges to UPS. We are an official BoAir authorized factory dealer. Due to our high volume of filter sales we can offer these filters at the LOWEST PRICE AVAILABLE ANYWHERE!! * Replaces your furnace air filters and/or air conditioning filters. Determine the size filter(s) you need and enter the size in the box above. Choose your filter thickness. Most standard filters are 1 inch thick. We also can make 2 inch and 1/2 inch thick specialty filters. Use the 5th drop-down menu above to choose how you measured your filter size. Either (A) The size you entered is printed on your current filter...or...(B) You measured the filter yourself with a tape measure. Note for multiple filter purchases: You will have to go through this process for each filter you order. Feel free to email us at sales@neverbuyanotherfilter.com with any questions. *Highest quality in the industry - we're so confident in our electrostatic filters that we back them with a lifetime warranty (10 years for commercial applications). *No polyester - BoAir electrostatic filters contain NO polyester, meaning they are easier than ever to clean, and they're less restrictive than competing products. *High performance - BoAir filters have undergone independent A.S.H.R.A.E. testing and boast dust arrestance in excess of 90% with initial resistance of a mere 0.10 w.g. at 1200 CFM. *Easy for you to maintain - BoAir electrostatic filters are permanent, washable and re-usable. Simply rinse with clean water, let dry and re-install. *The Only filter with VIBAX MI-50 - BoAir electrostatic filters are the only ones embedded with VIBAX MI-50, an anti-microbial agent which helps prevent the growth of mold and mildew. For the past 15 years, BoAir Inc. has manufactured its high-quality permanent air conditioning and heating filters for residential and commercial use. Our permanent filters are "drop-in" replacements for existing disposable furnace air filters and are up to 25 times more effective in removing airborne dust, spores, dander and other contaminants than regular filters. BoAir filters are constructed with 5 layers of media (not just three like others) and surrounded by a rugged aluminum filter frame. A unique combination of Polypro with Polyurethane foam media attract and hold the airborne pollutants inside the layers of the electrostatic filter until they are released by washing. Installation: Simply install your BoAir Electrostatic Air Filter where your old filter was located. The arrow on the filter frame indicates the direction of the air flow. Air will travel in through the light side of the filter and out through the dark side. Cleaning: BoAir filters should be cleaned every 4-6 weeks. To clean, remove your filter and use a brush or vacuum to remove dry dust. Next, rinse with water in the opposite direction of the airflow arrow. 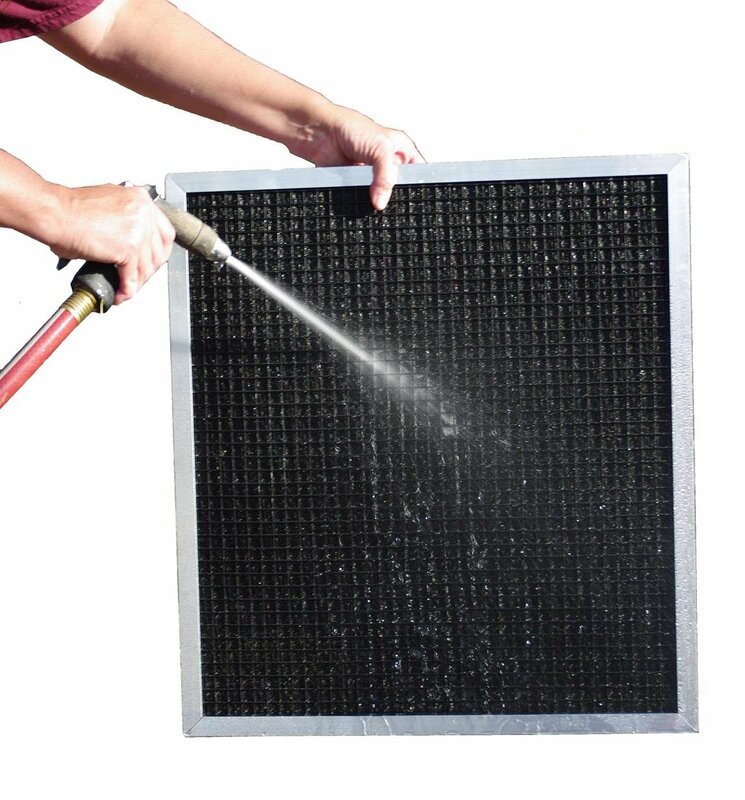 If necessary, an all-purpose cleaner such as Formula 409® or Fantastik® can be used to remove cigarette smoke residue or other contaminants that may adhere to the filter's media.. After using, rinse thoroughly, drain excess water until dry and reinstall. Don’t expose your filter to direct sunlight or extreme heat for any extended period of time, and never use oil or other chemical sprays on your filter. A Genuine BoAir filter can be identified by its logo and a unique serial number. Please allow 7-10 days for UPS shipping. CANADA: Canadian orders will be charged an additional $35.00 for shipping. Please allow 2-3 weeks for Canadian shipping. Colorado residents pay 3.9% sales tax. We have Genuine BoAir Filters in all standard and custom furnace filter sizes. Order today and save!